Picture: colorful and a total faux-pas! 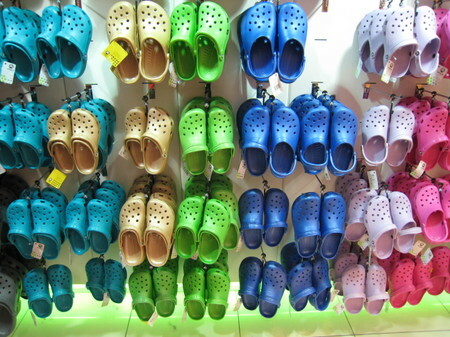 At Dublin airport (Ireland) I saw a new Crocs shoes shop that sold the rainbow-coloured plastic shoes. The shoes originally come from the hospital sector as they can be easily cleaned. And this is where they belong to and only there! Unfortunately in Malaysia for example people wear them even to clubs! In order to prevent such a trend step forward and say no to Crocs shoes! 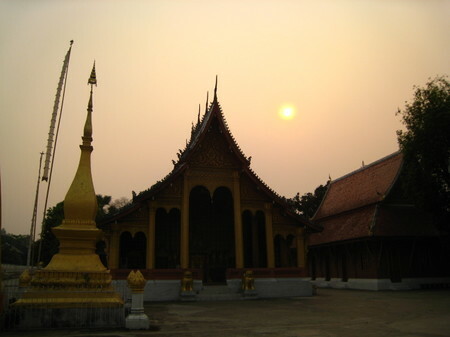 Picture: An ancient Wat (temple) at sunset in royal Luang Prabang, Laos. I recently read about an Englishman who was told by monks in Laos that he was born in the “wrong” country, meaning he was actually Laotian. On my fourth visit to the ancient royal town of Luang Prabang I definitely started to wonder if I am not part Laotian somewhere deep inside.As soon as I roam the sleepy streets of the old quarters, listen to the banging of the drums at 4pm (and 4am) and watch the Mekong majestically making its way south, the magic of Luang Prabang is back. This time I had the honor of attending the bi-weekly blessing of two houses, one by offering food to the spirits and one in handing over a small bamboo-raft with food and a candle to the Mekong at night in order to appease the spirit of Naga, the snake god. 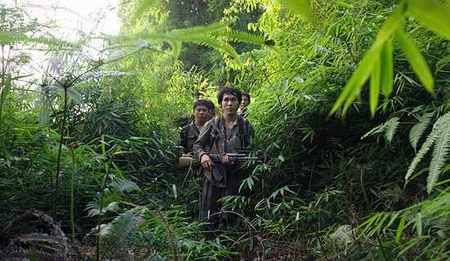 I just hope that the Chinese investments at the banks of the Mekong and the new hotels, including a 5-star hotel, will not chase the spirits away. 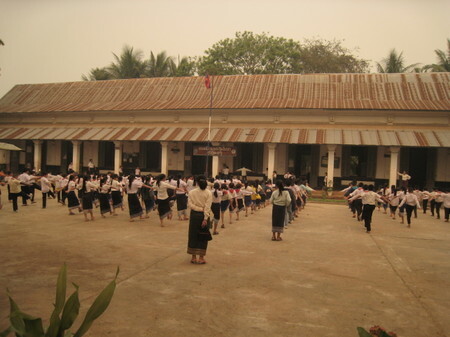 Picture: School children exercising in school together. Picture: The magical The Spa Garden at night. 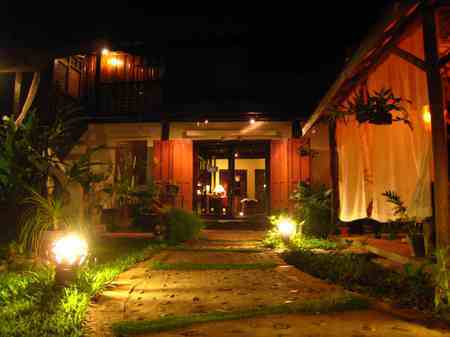 Each time my visit to Luang Prabang entails a massage by skilled hands at my sister’s spa called The Spa Garden. Situated in a lovely wooden house in the centre of the UNESCO heritage old town it oozes a calm ambience and the mind relaxes immediately (also because of the modest prices). 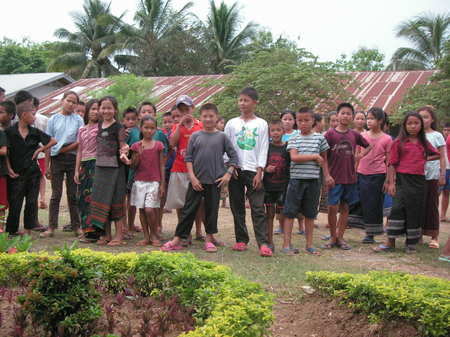 Picture: Your help is really appreciated in Laos! 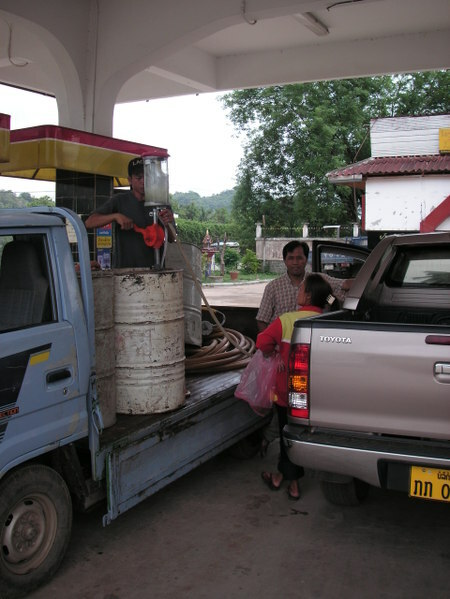 Picture: Filling up a truck with a hand-operated pump. What do you do during a power cut and need gasoline for your car? Well, without electricity there is no working pump and therefore no gasoline; except if you go back to the good old hand-operated pump and fill the petrol into bottles. 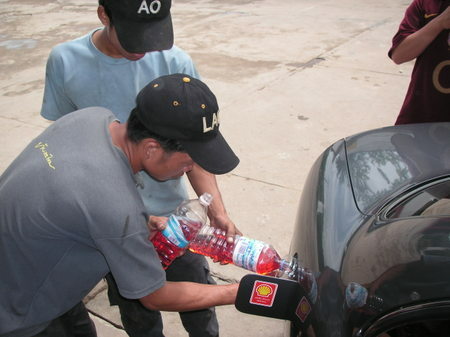 The bottles’ content is then poured into the petrol nozzle of the car. On this picture you see a petrol station employee operating the pump for diesel. Take a guess what he is up to? Take a guess what this guy is up to in Luang Prabang (Laos). Just leave a comment. 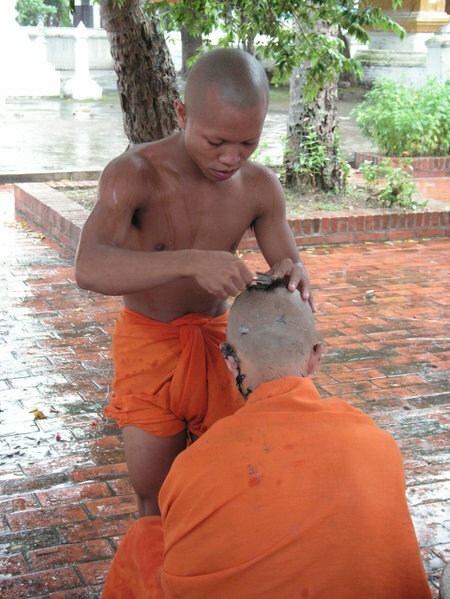 Picture: A day before Full Moon a monk's head gets shaven. Luang Prabang is just the most magical place in South-East Asia. But why? Mostly because of things that other Asian cities have and Luang Prabang does not: pollution, traffic jams, traffic lights, beggars, sidewalks littered with cars and pushy street hawkers. But it is not only the absence of many nuisances that makes Luang Prabang special; it is also deep-rooted Buddhism that is so embedded in daily lives. For example are there over dozens of Buddhist temples with about 2’000 monks and novices. The temples are the centre of village life and the celebrations are an integral part of daily life. There is the daily alms-giving at 5.30am when all the monks line up in the main street to receive food from other Laotians and foreigners contribute to this special atmosphere and once a month, one day before full moon at 4pm, all the temples start to beat their massive drums and gongs successively to celebrate Buddha’s day and all monks and novices get their head and eye-brows completely shaved. The sound of the drums and gongs echo through the streets and pierce the habitual quietness of Luang Prabang, creating a truly magical feeling. Watch here a 4MB movie Download luang_prabang_monk_beating_drum.MOV about a monk drumming the drum vigorously. I bought in the night-market two wonderfully hand-made umbrellas made from Mulberry Tree leaves and bamboo. The umbrellas come in different natural colors and are waterproof due to an oil-seal. 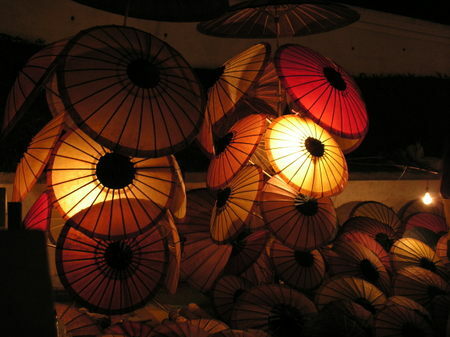 The umbrellas are fully hand-made according to an ancient tradition in Luang Prabang by father and son. For 10$ for a big size umbrella they make for a perfect decoration. Many backpackers can be seen with the ubiquitous Beer Lao T-Shirts that are sold everywhere. I guess they think it is cool to have a Beer Lao t-shirt at home or they might think the beer is exceptional. For my part I try not to support multinational companies like Carlsberg, the owner of Beer Lao, with free advertisement. But then again I have to give praise where deserved and the new Beer Lao Dark deserves it. Its rich slightly sweet taste makes for a wonderful compliment to Laotian food in a sweaty summer night and I can whole-heartedly promote this excellent brew.